The original Ford Model A is the first car produced by Ford, beginning production in 1903. Ernest Pfennig, a Chicago dentist, became the first owner of a Model A on July 23, 1903. 1,750 cars were made from 1903 through 1904 during Ford's occupancy of its first facility: the Ford Mack Avenue Plant, a modest rented wood frame building on Detroit's East Side. The Model A was replaced by the Ford Model C during 1904 with some sales overlap. The car came as a two-seater runabout for $800 or the $900 four-seater tonneau model with an option to add a top. The horizontal-mounted flat-2, situated amidships of the car, produced 8 hp (6 kW). A planetary transmission was fitted with two forward speeds and reverse, a Ford signature later seen on the Ford Model T. The car weighed 1,240 lb (562 kg) and could reach a top speed of 28 mph (45 km/h). It had a 72-inch (1.8 m) wheelbase and sold for a base price of US$750. Options included a rear tonneau with two seats and a rear door for $100, a rubber roof for $30 or a leather roof for $50. Band brakes were used on the rear wheels. However, it was $150 more than its most direct competitor, the Oldsmobile Curved Dash, and so did not sell as well. The company had spent almost its entire $28,000 initial investment funds with only $223.65 left in its bank account when the first Model A was sold. 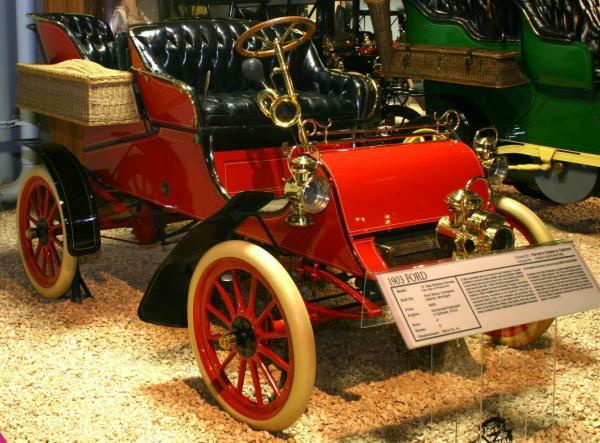 The success of this car model generated a profit for the Ford Motor Company, Henry Ford's first successful business. Although Ford advertised the Model A as the "most reliable machine in the world", it suffered from many problems common to vehicles of the era, including overheating and slipping transmission bands. The Model A was sold only in red by the factory, though some were later repainted in other colors. Owner starting and driving his 190 Model AC Ford, Early Ford Registry tour, August 2011. AC:RC RC Ford Power, Ford "Built Tough"
Starting and driving a 1907 Ford Model K in Nebraska 7 days before Christmas. 30 degrees F.